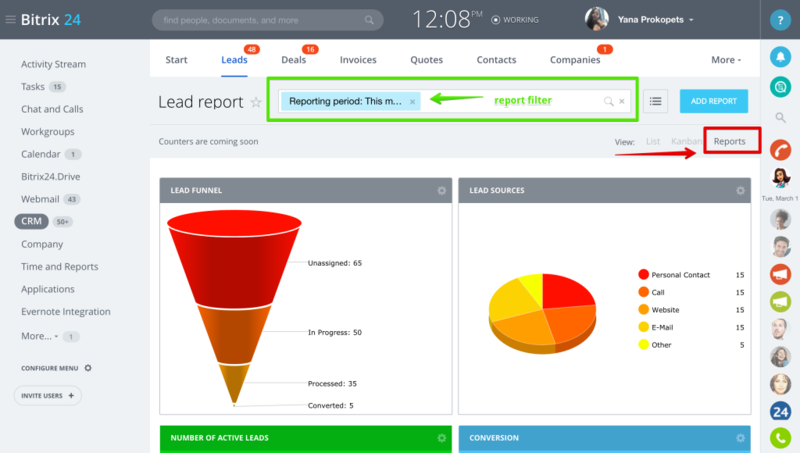 Bright & informative dashboards for leads can be found under Report View In Leads. This tool can help you to measure sales managers work efficiency, track conversion, analyze best lead sources and much more. Important: fist time you open the report it will be shown in the demo view, just hide demo data to construct your own report. You may also need to update the leads statistics for the system to collect all data about your previous leads and take them all into account (in this case you will get a system message with the tab "run"). Lead funnel widget shows leads distribution by leads statuses. All of such calls will be analyzed by the system and results shown in the reports distributed by the correct lead source (configured in telephony settings). Important: this option is available for Bitrix24 commercial plans subscribers. Conversion: one of the most important indexes of leads management efficiency is leads conversion. 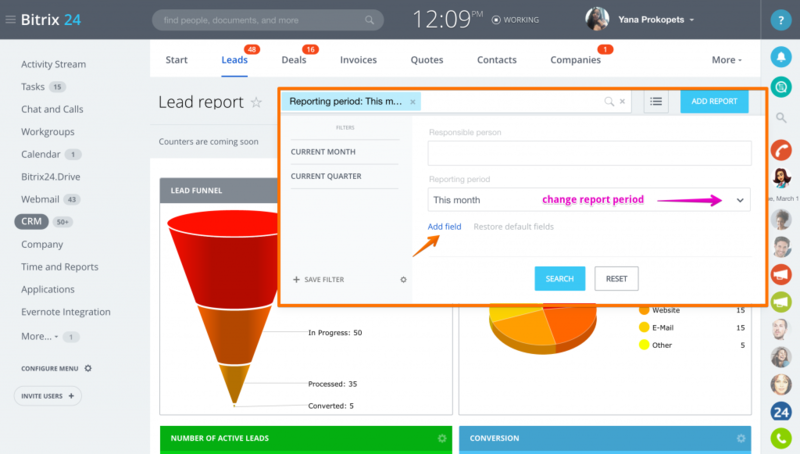 The following reports give a quick insight of your sales team work results for the particular period: number of active leads, conversion rate, lost leads rate, number of converted and junk leads. - Active leads - leads that your sales agent has worked with during the report period (has finished activities or changed lead status). - Number of converted leads - total amount of leads gone through all lead's statuses and finally converted to contacts, companies or deals. - Idle leads - leads that nobody has worked with from the moment of creation - e.g. when a big amount of leads has been imported to the CRM. - Number of activities - number of finished activities on active leads during the report period. - Junk leads - leads that haven't been qualified to be converted to contact, company or deal and therefore have been closed as junk. Leads converted leaderboard: reflects your rank & amount of leads converted by you during the report period. It also shows 2 closest to your rank users ("competitors"). This is a motivation board for the sale agents. or set by the top filter for all widgets. 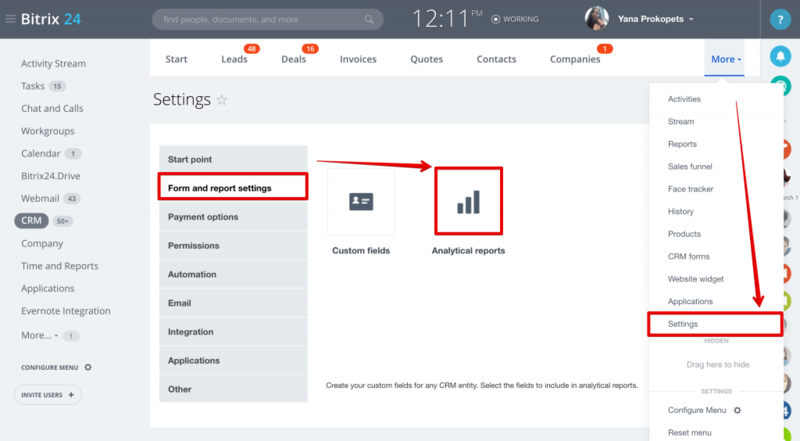 You can add your custom fields to be analyzed in the report in Settings > Form and report settings > Analytical reports.